When you deal with very dynamic dictionaries, you have always to check if the data exists before accessing it. This can blow up your code. With the dynamic data type (.NET 4.0) you can do this a little bit more elegant. Here are my data classes. You see that the Person class has a dictionary which can take every object as a value. // Check if key exists. Then read and cast the value. 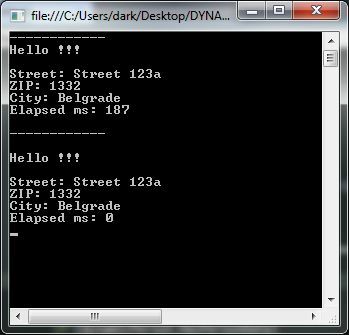 With dynamic data type it could be like this. First you have to create a class which derives from DynamicObject. I added to this (abstract) class a generic type “T”. So the code will be usable for other dynamic classes like “Person” too. Then you have to create a conrecte class, which derives from DynamicHelper. This class here is for my dynamic/flexible type “Person”. _data Data object. In this example an object of “Person” class. _exists A Func<> which checks if the data object contains a specific key/property. _getData A Func<> which retrieves a value out of the the data object. You see that the code above first reads the data out of the “pers” object the dynamic way. Then it reads the same data but the “normal” way with contains-check and casting. Looks good or not? The code is a bit clearer when using the dynamic extension. But the performance is poor. The dynamic extension needs !!187ms!! for reading the data. And the other piece of code is a lot faster.